Sinsaenum and earMUSIC are pleased to announce the release of Ashes, the brand new EP by Frédéric Leclercq and Joey Jordison's extreme death metal project. 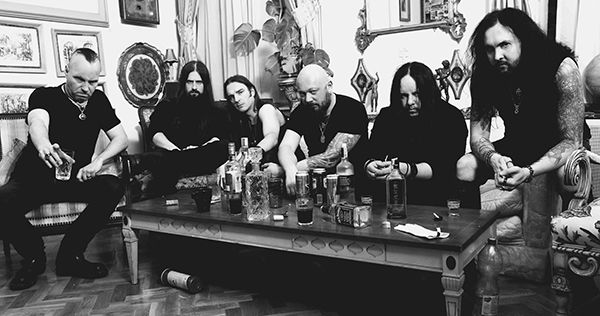 Sinsaenum's current LP Echoes of the Tortured, which has been nominated as "Best Debut" by Metal Hammer Germany, is an album that has been praised worldwide as one of the freshest and finest approaches to death metal. Following the 2016 release of the band's celebrated debut, Sinsaenum now go beyond and have truly reached the next level. Ashes will be released on November 10 via earMUSIC. It is available via Amazon and iTunes pre-order. The EP contains over 30 minutes of mind-blowing music, featuring three brand new and EP-exclusive songs, which all display Sinsaenum's love for the roots of death metal and extreme music. Additionally, two previously exclusive Japanese bonus tracks can finally be enjoyed by the rest of the world. To top it all off, renowned French producer and musician Frederic Duquesne (Mass Hysteria, guitar) has provided a remix for "Dead Souls." The cover artwork was drawn by Maxime Taccardi, a dark, twisted artist who managed to capture the essence of Sinsaenum's music. "Ashes is showing a more mature version of our music, and also an angrier side," said Leclercq. "A lot angrier. We wanted the production to be rawer. Nothing is polite here. We just want to grab the listeners by the throat and spit our hatred into their face. With this EP, we took things further. The black metal vibe is more present in the three new songs, as are the synths; they reinforce the eerie side of our music. Experimenting with keys and machine is not something we are afraid of. Musical darkness can come in many ways." With these impressive credentials, it is hard not to label Sinsaenum a "supergroup," since the project embodies the joint venture of Fred Leclercq of Dragonforce and Joey Jordison (VIMIC, former Slipknot drummer). The rest of the band is of no less importance and credibility: Attila Csihar (Mayhem, vocals), Sean Zatorsky (Daath, vocals), Seth Heimoth (bass), and Stephane Buriez (Loudblast, guitar) – all of which are well respected in their fields – complete the ensemble, making Sinsaenum premium-level heavy metal.